While out running some errands out in Mentor, Zak and I saw a Marc’s and decided to do our grocery shopping there instead of the store closer to home. I am very pleased we did, because they had a few things which “our” Marc’s is generally lacking – including alfalfa sprouts. Zak wanted to make some sandwiches using them, so we did. These were both intensely delicious and very healthy. 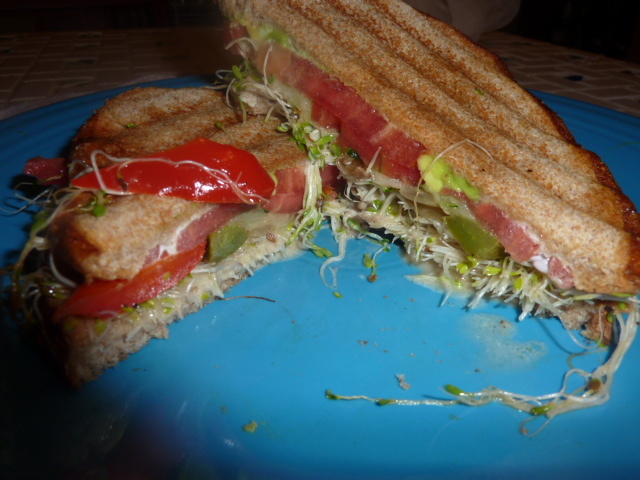 Whole wheat bread, alfalfa sprouts, tomatoes, onions, and peppers – what’s not to love? A light smear of mayonnaise holds the whole thing together. By grilling the sandwich on either a panini press or by using a grill pan and a weighed down cast iron skillet, you fuse all the flavors and create a sandwich of manageable size. Spread each slice of bread with a little bit of mayonnaise. On bread, stack tomato, then alfalfa sprouts, then dressing, then fajitas. Top with the other slice of bread. Cook on a panini press about two minutes per side. Alternatively, heat a grill pan over medium-high heat and spray with nonstick. Meanwhile, heat a cast iron skillet over medium high heat. Add sandwich to the grill pan. Spray the bottom of the cast iron skillet with nonstick spray and place on top of the sandwich. Add a large can of tomatoes (or something similar) and lightly press the skillet down. Cook about two minutes until bread is toasted. Serve immediately. I’m not a huge fan of green bell peppers. I mean, they’re okay, but I’d take pretty much any other kind of pepper over a green bell pepper any day. 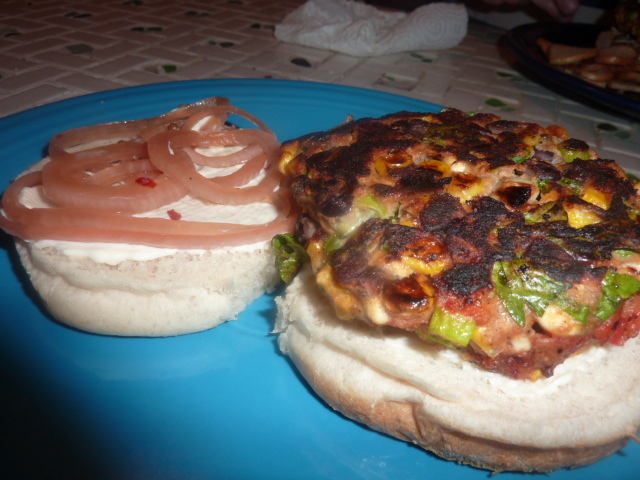 With the exception of two recipes – stuffed green bell peppers in tomato sauce, and a broiled or fried pepper sandwich. My dad frequently fries up green peppers and makes a sandwich out of them, and it’s always been one of my favorite sandwiches. Recently, I’ve been adding another element in the form of sriracha – because sriracha makes almost anything better, and adds a nice heat to this sandwich that makes it extra special. 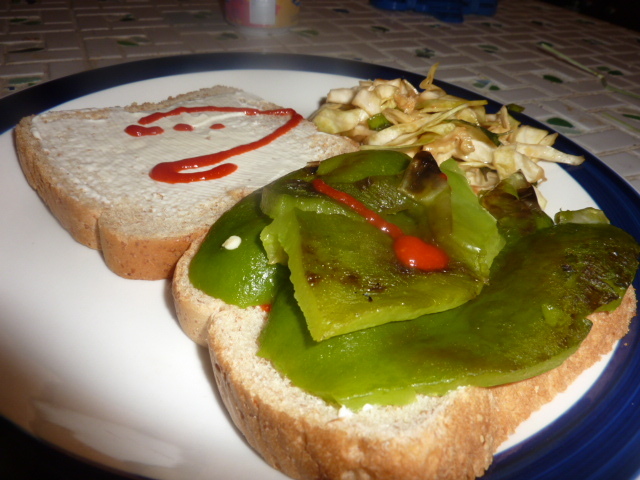 Green bell peppers are perfect for these sandwiches – their natural slight bitterness is played up by the char, and then balanced by the mayonnaise. You can either broil, grill, or fry these peppers – I broiled them, for the simple factor that it’s slightly healthier than frying and I didn’t think it made a whole lot of sense to fire up the grill just for these. I’ve had the sandwich prepared all three ways, and it’s good no matter what. Even Zak, an avowed green pepper disliker, was pleased with this. Option one: Preheat broiler. Place pepper under the broiler and broil 3-5 minutes per side until deeply charred. Transfer to a ziplock bag for 2-3 minutes. Using a pair of tongs, separate charred outer flesh from tender inner flesh. Spread mayonnaise and sriracha on the bread. Season with pepper. Cut peppers into strips and place them on the bread. Option two: Preheat grill. Place pepper on the grill and grill 5-7 minutes per side until deeply charred. Transfer to a ziplock bag for 2-3 minutes. Using a pair of tongs, separate charred outer flesh from tender inner flesh. Spread mayonnaise and sriracha on the bread. Season with pepper. Cut peppers into strips and place them on the bread. Option three: You will also need 2-3 tbs. of canola or vegetable oil. In a large non-stick pan, heat oil over high heat. Meanwhile, cut pepper into strips. Fry peppers 8-10 minutes, tossing frequently, until heated through and charred in spots, being sure to use a splatter guard. If necessary, remove tough charred outer flesh from inner tender flesh. Spread mayonnaise and sriracha on the bread. Season with pepper. Cut peppers into strips and place them on the bread. This is a pictureless post, because it’s something I eat for lunch in the office and I haven’t been able to either get my wits about me enough in the morning to remember to pack the camera or get a picture that looks like more than a blurry blob with my super crappy cell phone in our not-so-well-lighted lunch room. But the results are so delicious – and such a great way to use the pickled shallots I recently posted – that I absolutely could not resist posting it. This lunch is super inappropriate to eat in the office. Sardines plus blue cheese plus pickles = smelly factory. So I always make sure I have plenty of gum in my purse for after. Because as a huge lover of both sardines and blue cheese, once I started thinking about this dish I absolutely could not get it out of my mind. Also, since we went on vacation a bit back, I had been holding off on grocery shopping until we’d received our first week’s CSA share – so things were looking a bit sparse in both the pantry and refrigerator. 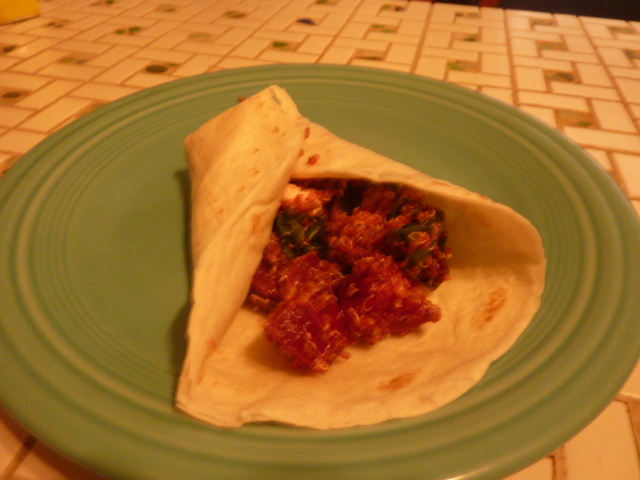 Those lean times tend to be when I make some of my favorite dishes, and this is no exception. So much that I made it again a few days later, when my pantry and fridge were fully stocked. This open-faced sandwich is definitely not for the faint of heart (err … palate). The blue cheese is pungent and rich and creamy. The sardines are, well, sardine-y – briney and delicious. The pickles are packed with a punch of coriander and vinegar, cutting through the richness of the cheese and fishiness of the sardines. Balanced with a punch of mustard, this whole dish is spot on. Lightly toast the whole wheat bread. Top each slice with half of the blue cheese crumbles. Transfer either to a preheated broiler or place in the microwave for about thirty seconds until cheese is bubbling and melting. Meanwhile, whisk together the pickle juice and mustard. Season with salt and pepper to taste. Top each cheesy toast slice with sardines, sliced pickles, and a tablespoon or so of the pickle juice mixture.